We are having this tonight and it is yummy great way to have something easy but a little more than just white rice. 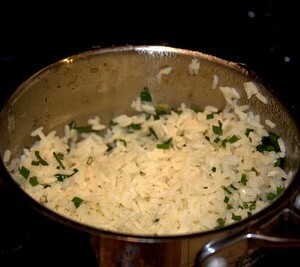 Heat the olive oil in a large sauce pan over medium heat once the oil is hot add the rice and cook for 1 minute. 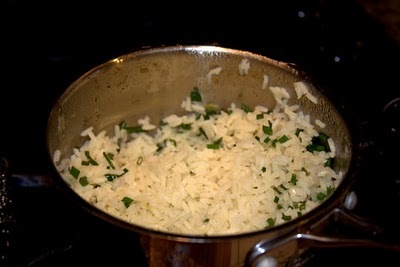 Then add the garlic then cook for another minutes stirring the whole time, be careful not to burn the garlic. Then add the chicken broth and season the water with a bit of sea salt and pepper, to taste; bring to a boil. Cover, reduce heat, and cook over medium low for 20 minutes, stir about every 5 minutes.. Remove from heat and don't touch for 5 minutes. Add the chives and mix until well combined. Serve immediately. Enjoy.